This sports duffel bag is made of fine canvas.It is soft,durable and lightweight.With top handle straps and removable and adjustable padded webbing shoulder strap,it is easy to carry and use. 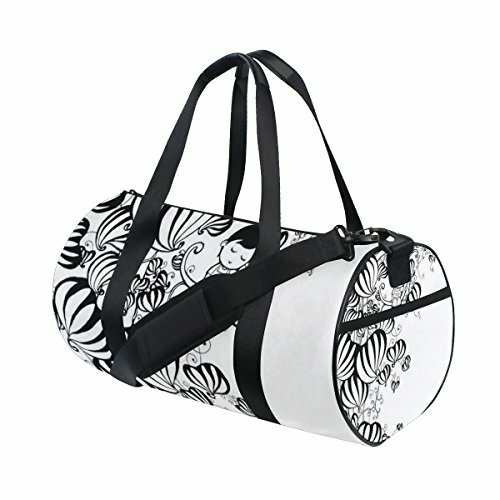 This fashion canvas travel duffel bag is perfect for outdoor, sports, travel, beach, school and etc.It would also be a great gift choice. Material: fine canvas+nylon strap+smooth zippers,lightweight,durable and comfortable. With top handle straps and collapsible and adjustable padded webbing shoulder strap,easy to carry. One side pocket,one side zipper pocket,one inner compartment pocket for storage of your small parts. Perfect as a travel duffel bag,sports bag,gym tote bag,yoga bag,travel holdall for your sports,travel,camping,dance,playing baseball basketball football and other activities. View More In Sports Duffels. If you have any questions about this product by JIUMEI, contact us by completing and submitting the form below. If you are looking for a specif part number, please include it with your message.